Half Full has a rustic styled interior and serves mainly Spanish meals and tapas. Other dishes include a full English breakfast, French bean salad and Scottish lobster with mango and spinach. Do you work at Half Full? What did you think of Half Full? Mill Hill has largely been ignored in recent years due to its out-of-the-way location; however, with a few decent pubs and eateries it’s becoming increasingly difficult to ignore. Step forward, Half Full with its chef who trained under Gordon Ramsay. Half Full cuts an attractive figure on the high street with a black colour scheme framing the large windows and a red canopy hanging low over the street. In the summer months a few red chairs are put outside on the pavement for alfresco dining, although the main road isn't exactly the prettiest of views. Inside, it's a lesson in simplicity. The decor is neutral with clean lines and white and cream walls, and the large windows flood the space with light in daylight hours. Wooden floors are complemented by wooden tables and iron chairs and bar stools, which are something of a feature throughout. There’s a large bar and granite serving counter and you can sit up here if you’re just after a laid back snack rather than a full sit-down meal, which is a nice touch. Not everyone has caught on to Mill Hill as a place to visit and so the main bulk of the Half Full clientele seems to be locals – and many of those seem to be regulars. It also means that although this is a much respected restaurant, you won’t end up facing massive waiting times for tables, or have to book weeks in advance like you might if you picked it up and plonked it in the heart of London. The staff are also genuinely friendly and show an excellent working knowledge of the menu, having clearly been very well trained. All valid reasons to make the trip. The chef, Fadel Hassaine, trained under Ramsay, and with the likes of Angela Hartnett, Marcus Wareing and Jason Atherton benefiting from the infamous chef's tutelage, it’s no surprise that the cuisine here is top quality. 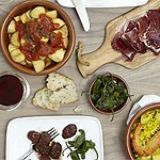 Half Full specialises in Spanish dishes and the prices are in line with the area, so are pleasingly at the lower end of the scale. 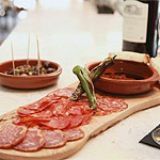 Although they do a standard a la carte of dishes like soups, burgers, various fish fillets and meat dishes like lamb rump, it seems a shame to ignore the tapas. Priced at £4-£7 it’s certainly reasonable, and you can have a couple of dishes as a starter to their other highlight – the paella. The grilled halloumi (£4.25) is delicious and creamy, with that pleasant ‘squeaky’ consistency. The calamari fritos (£4.45) is delightful – fried pieces of crisp battered calamari with a meaty texture that doesn’t tend toward chewiness. Alternatively, the hearty, well spiced albondigas meatballs come in a sweet, slightly spicy tomato sauce and are a steal at just £5.25. Round it off with an incredibly reasonable – and very large – paella for £21.95 for two people. The seafood paella comes with plump prawns, fresh cod, tuna and well-textured squid for a perfectly seasoned and spiced (not to mention oh so filling) paella that really does taste of Spain. The drink selection at Half Full is a little, erm, half full... well, it’s on the short side anyway. Still, it covers some decent wines, costing £15-£35, that have been selected to complement the strong Mediterranean flavours in the food. Otherwise, there are a couple of bottled beers and a handful of classic cocktails (priced at £6.50) that seem to have just been thrown in for good measure. 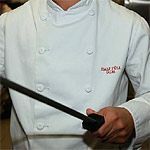 The skills of the chef really shine through and the quality of the food surpasses the low price tag that comes with it. This is definitely worth making the trip to Mill Hill for.